Like pasta, soba noodles are available in dried form in supermarkets, but they taste best if freshly made by hand from flour and water. 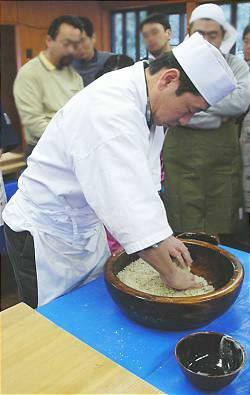 Soba making has also become a popular tourist attraction for domestic and international travelers. The activity is offered by many community centers and travel tour companies. 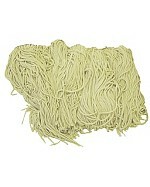 Below you will find an illustrated description of the soba making process. 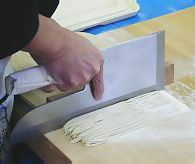 The first step, mixing the flour with water into a dough, is considered the most important and difficult part of making soba noodles. The correct amount of water is added step by step to the flower and mixed for several minutes until the flour becomes moist enough to be formed into a dough. The dough is then pressed until it becomes very smooth and contains no more air. The dough is then rolled into a thin square by repeatedly rolling it around a wooden rolling stick. At last, the dough is folded and cut into the noodles. 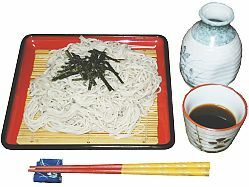 For zaru soba, the noodles are then boiled and cooled down with cold water, before served with a soya based dipping sauce (tsuyu), wasabi, nori seaweed and negi (Japanese leek). The water used to boil the noodles (soba-yu) is often added to the remaining tsuyu and drunken at the end of the meal. Other popular soba dishes are noodle soups with various toppings, such as Kitsune Soba, Tanuki Soba and Tsukimi Soba. Despite the name, the popular dish Yakisoba is not made with soba noodles, but rather with Chinese style noodles (chukamen).